I have been using my Aquaero 6 XT for about 3 months and I'm absolutely loving it thus far. I hesitated at the premium price tag for years, but now wish I had bought it ages ago. Totally worth every penny. 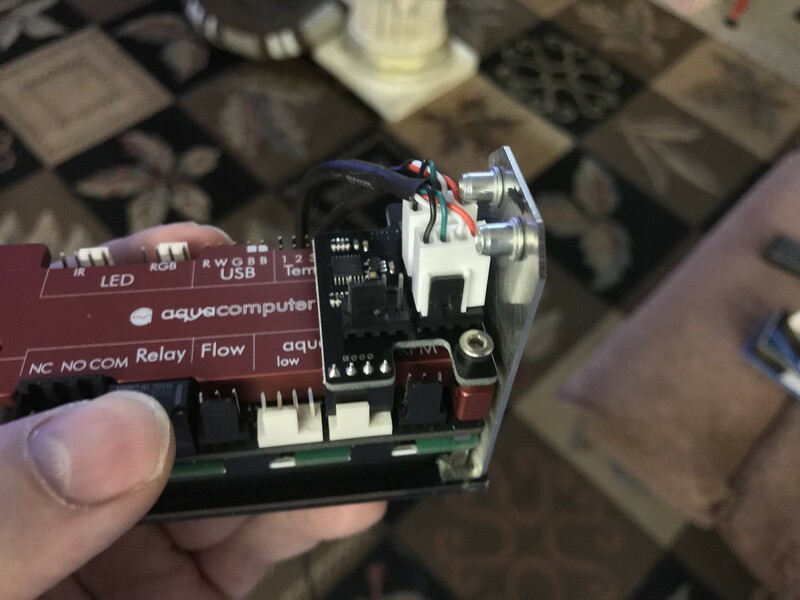 How do I know which sensor is which in the Aquasuite software when I am setting up my pump and fan speed controls? 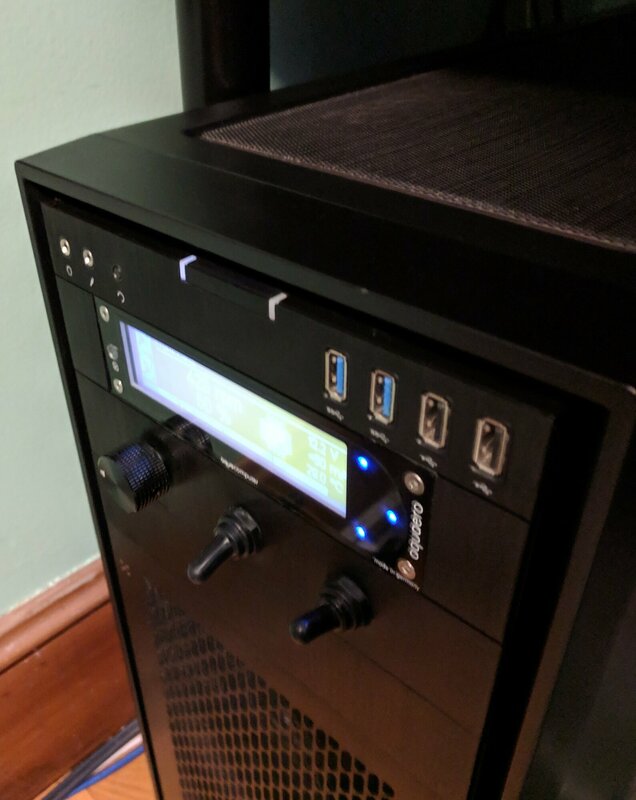 Do I just have to plug them in one by one, name them appropriately (like GPU temp in, GPU temp out, CPU temp In, CPU Temp out) power down, and install the next one, etc. etc? Or do they have some sort of unique identifiers? Once installed, is there any risk of them moving around or should they stay the same indefinitely? I asked that question when the device was introduced, but there was never an answer or reply. I just received my aquabus X4 and 2 calitemps and had started to play around with them when my primary machine died. Best I remember, the top/outside port is one, the middle port is two, the bottom port is three and the port by itself is four. Hopefully you can confirm this by applying heat (touching them?) and seeing which sensor in the aquasuite moves. Do NOT assemble the entire thing and expect to be able to plug the calitemps into the aquabus X4. Two of the ports conflict with the aquaero mounting bracket screw rivets, one you may be able to force, but the other you will not plug in. You need to loosen the two front screws on the aquaero so the mounting bracket can be tilted out allowing the plugs to be plugged in. Then you can tighten the front screws securing the mounting bracket back in. I believe there is sufficient room (barely) once the plugs are installed. The first picture below shows the aquabus X4 installed on the product page, but the mounting screw rivets are truncated. In the second picture you can see the actual length of the aquaero mounting screw rivets. Geez. That seems like kind of a design flaw. Seems to be a standard 4-pin fan cable though, so there are likely many local alternatives that would work. Any 4 pin extension cable will work, I'm using a few of them myself. Would really be nice to be able to tell the difference between each calitemp as well. It'll be a pain to plug them in one by one to tell. I had issues installing the X4 to the AQ6. Couldn't believe what I was witnessing and how could this design flaw have been missed. Regardless I still made it work. Here are some images to paint the picture on what went on. I thought it was going to cut the wire while pressing down on the female header. At the design stage this would not have been a difficult fix. Simply move the two ports in conflict with the screw rivets to the left above the current single port, and move the electronics under the screw rivets. aquacomputer is generally meticulous with their designs... whomever was in charge of this project failed. In my mind it is worth a remake and recall. Exactly what I was thinking with all that room there. I think it could have been planned as such but somehow it slipped through the cracks. Maybe a late night mistake. Yeah, I think I am just going to use a short 4 pin fan extension cable, and then double sided tape the x4 board somewhere nearby in the case. That should make this a little easier to deal with. Yours looks very different than mine. What is that red thing all along the back? That is the optional heatsink. 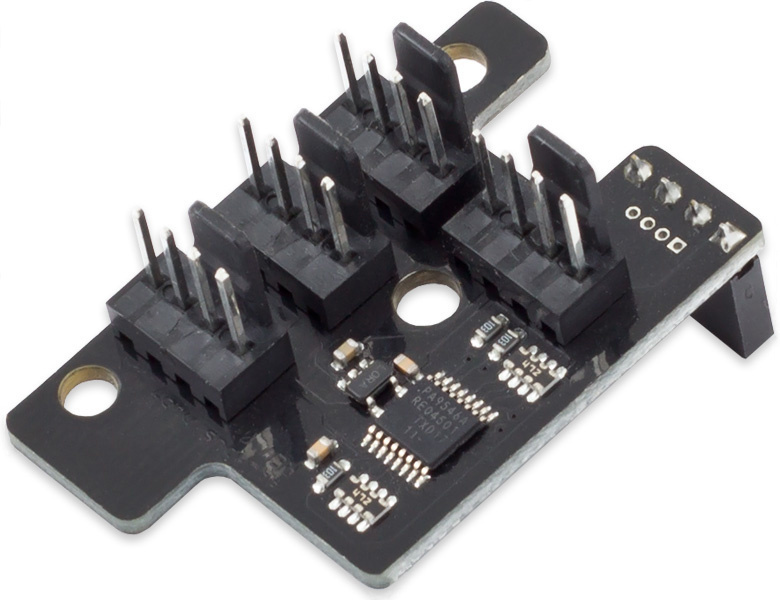 Helps dissipate any heat generated from the controller. Yeah, so I did as planned, used a spare Noctua 4-pin fan extension cable I had laying around to place the X4 board remotely. 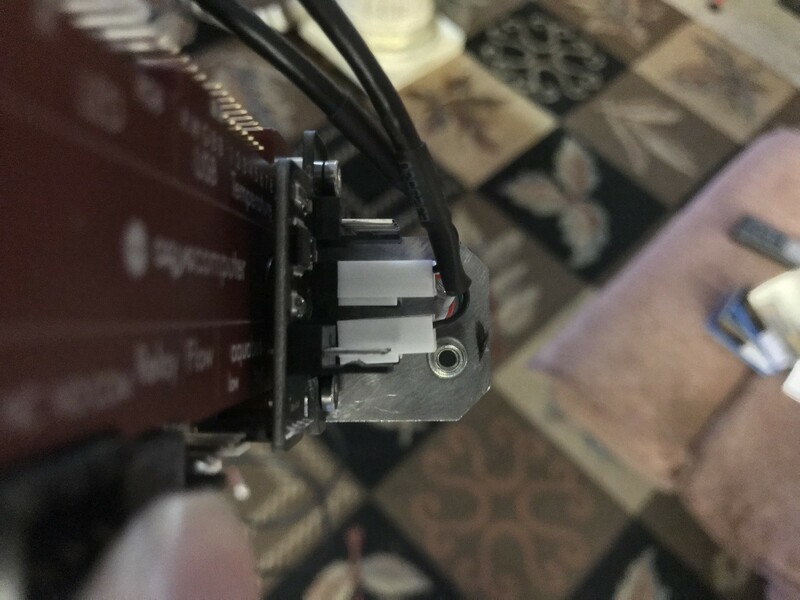 I used 3M double sided mounting tape, to tape it in a spot on the back of the motherboard tray, where there was a hole poking through so I could connect the connector on the back. 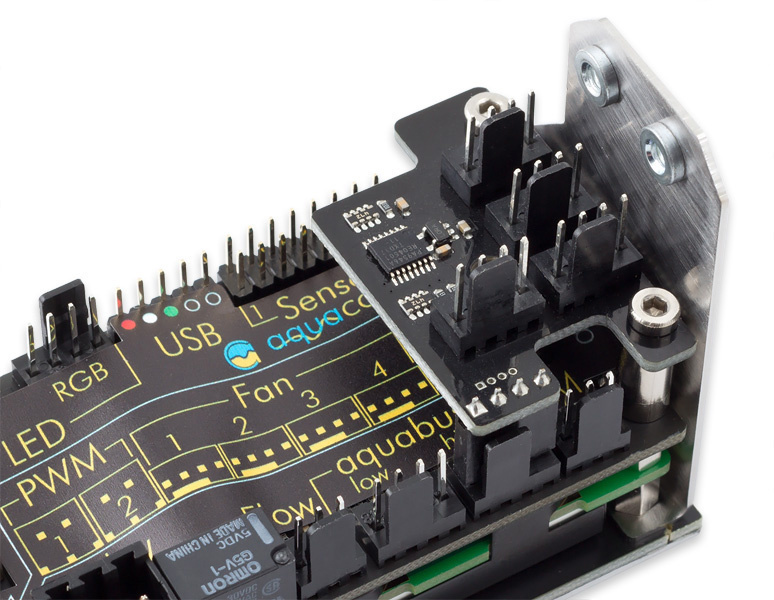 You just have to watch out and make sure you get the pin orientation right, as the X4 board does not have any keying, as it relies on its install orientation on the Aquaero for orientation. In my testing, the connector on its own wound up being Calitetemp 1, then the top connector on the right was 2, middle was 3 and bottom was 4. 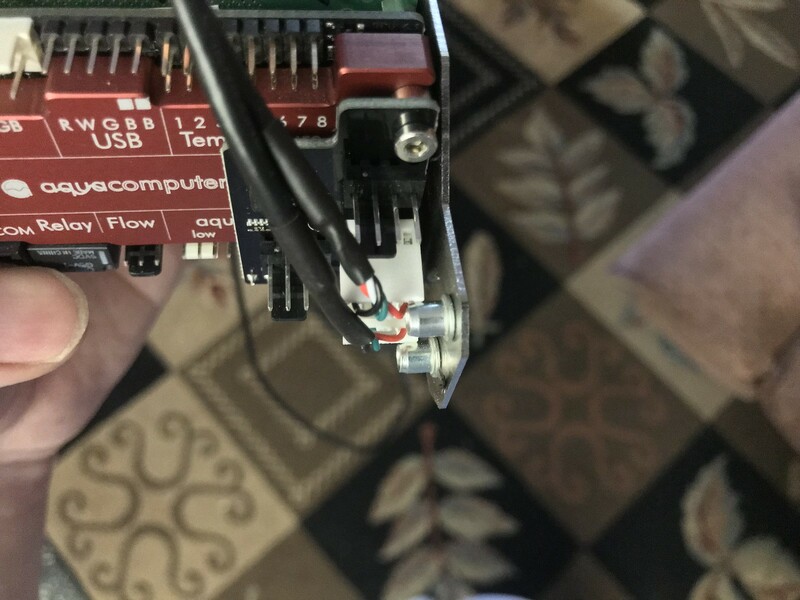 I used a USB plug to internal header adapter cable in order to plug in to my laptop, so I could run Aquasuite and identify the temperature sensors while my loop was apart, and the system wasn't running. When would one need this? Is this only for people who use a large number of voltage controlled fans? I'd imagine the resistors would create a good amount of heat if that is the case. 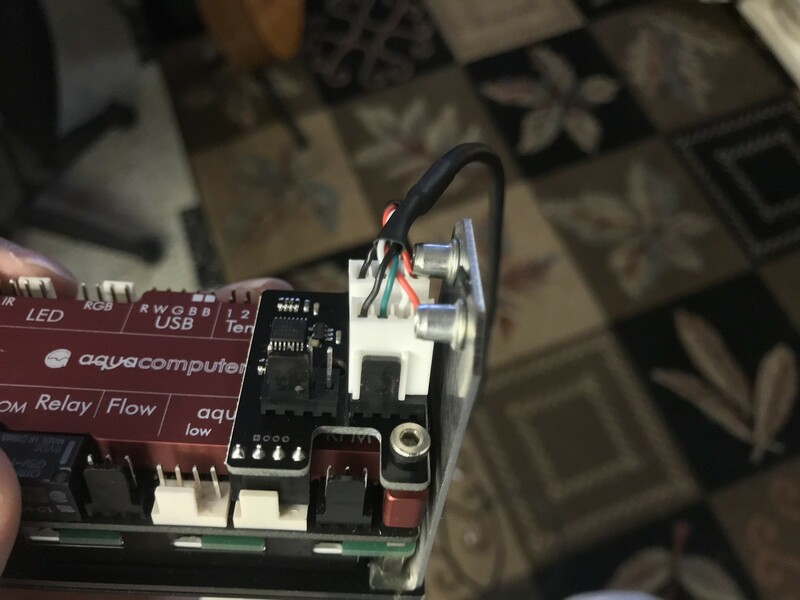 Personally I use three standard temp sensors, 4x Calitetemp sensors, a flow sensor, two PWM outputs for fans and one PWM output for my pump. 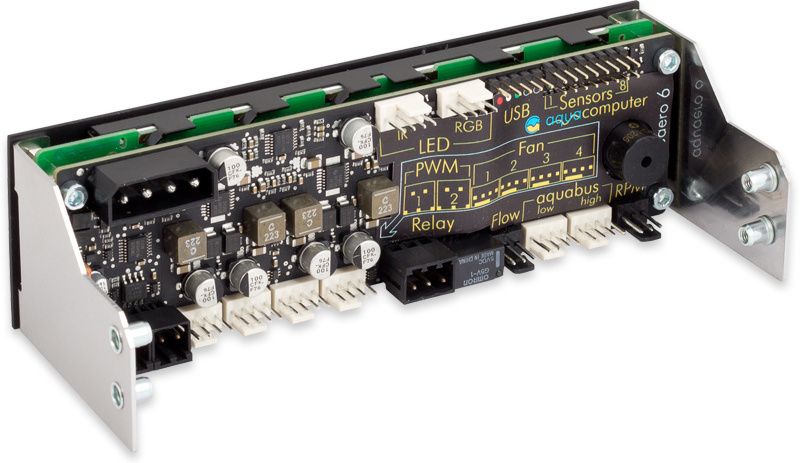 The PWM outputs don't even draw power from the Aquaero. I use them just for control. I'd imagine in this setup, heat is less of an issue? I am considering adding PID style Setpoint control to my system though. I wonder if this results in added processing and thus more heat. I would probably recommend this if you're almost at 30w per channel for example but most of us I don't think aren't even close but I still like using it to help dissipate any heat since that area doesn't have too much air flow to begin with but for piece of mind. THe place where mine is installed is a real pain to get to, so I'd rather not take it out to install a heatsink at this point.